The Wistful Wild (のぞみの大地?, lit. 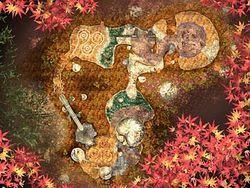 : "Land of Wishes") is an area that can be accessed in Pikmin 2; it is made available once the Hocotate Freight company's debt has been fully repaid. The design of this area appears to be a combination of The Impact Site and The Final Trial from Pikmin. It contains three caves and five treasures above the surface which total a value of × 3175 in treasure, or × 13285 including treasures found in caverns ( × 13275 in the European version of the game). It is also a representation of Autumn. Contents of the region include two large lakes, one of which can be drained and the other a bridge built over; a clearing with three random-typed Burgeoning Spiderworts; and decorating it are rusted metal structures, tree stumps and Foxtails, and a half-visible yield sign where the Onions land. Every 30 days from day 1, one can see some weird insects in this location, appearing as swarms of very small orange bugs. They release poison occasionally if attacked, and have an extremely small amount of health; each one drops a blob of nectar or spray when killed. They are found in two locations: outside Dream Den, and by Hole of Heroes. A Gatling Groink in the Wistful Wild. Comparison between the two visible level models. Note the slight differences in shape. When the Hocotate ship's icon is placed on top of the Wistful Wild and the Piklopedia or the Treasure Hoard are entered, the archives will be seen on a different model which has identical level design to the one used in the in-game Wistful Wild, in contrast to what happens with the other areas, which have some notable differences. 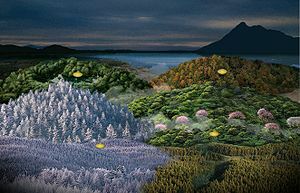 The most obvious difference between the in-game Wistful Wild and the Piklopedia version is a change in background theme; while the Wistful Wild version takes place in an autumn-themed forest plain with some stumps, the version used in both the Piklopedia and Treasure Hoard is situated between a dense bamboo forest and an actual autumn forest with actual, modeled, trees. A lone leaf on a stump at the pathway separating the section with the Anti-hiccup Fungus and the section with the Creeping Chrysanthemums is also positioned slightly differently, over the poisonous black gate that would be present in the in-game area. The red leaves seen during the landing cutscene are absent. The only noteworthy difference in the general level design aside from the background is that the pathway separating the section with the Anti-hiccup Fungus and the section with the Creeping Chrysanthemums is a bit tighter in the Piklopedia variant. An alternate view of the landing zone. The entrance to the Cavern of Chaos. The shortest of the two paths that connect the two sections of the Wistful Wild. The area with Burgeoning Spiderworts. The zone after the bamboo cane. The large tree stump on the second section. The pond on the second section. Carrying paths on the Wistful Wild. A map of the Wistful Wild showing treasure locations. 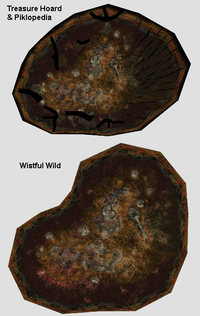 The patterns for The Impact Site and The Final Trial compared with a map of Wistful Wild. The texture used for the radar pattern. 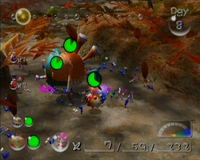 It is possible for a leader to get up onto the wall borders of the map via several enemies, including the Decorated Cannon Beetle and Watery Blowhog. This video shows how much of the area can be explored there. The YIELD sign that makes up the starting arena is actually a Stop sign in the Japanese version. The "start" and "end" of the area are the same as the locations of the final and first ship parts in Pikmin, respectively. The Wistful Wild is the only area in Pikmin 2 to not have an above-ground boss fight of any kind. The Wistful Wild was originally going to be called the "Land of Promise", as seen in the early English script left inside the game.It is possible that it was changed due to the religious connotation. This name is retained in all other language versions, however (see here). In the New Play Control! port, it is possible to destroy the water clog before taking down the bramble gate. 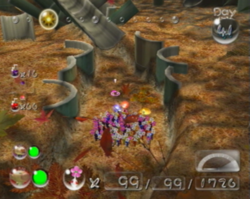 This can be achieved by throwing Pikmin to the edge north of the clog, then using the group move function to guide them to the lake. Then, they can be guided to the northwest of the clog using some more group moving commands, and finally, they can be dismissed, remotely whistled, and guided east by a leader standing near the gate looking at the gate. They can then be dismissed on the clog. This article was a featured article from June 18th to August 18th, 2009. This page was last edited on April 25, 2019, at 14:51.